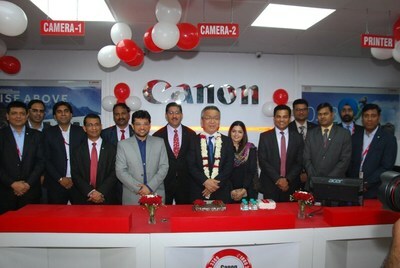 Speaking at the occasion, Mr. Kazutada Kobayashi, President & CEO, Canon India, said, "At Canon, customer delight is not just a tagline for us, it is a philosophy which we abide by, leading to a strong bond with our customers. We truly believe that happy and satisfied customers contribute immensely towards the growth journey of a brand and our two decade old legacy in the country stands testament to the same. Along with providing world class products and solutions, it has been our constant endeavor to come closer to our customers through our robust service support." Mr. Kobayashi further added, "North region has been one of our key focus markets and the launch of our ASF Level III center and PIXMA Zone in Ludhiana will be a step further to fortify our connect with our customer community. We foresee this launch to be yet another milestone in our journey of customer delight, enabling us to penetrate into the widest geographies in the country." Elaborating on the ASF Level III center, Mr. Rahul Goel, Director, Market Engineering Center, Canon India, said, "We, at Canon have a nimble service infrastructure, catering to our customers across the length and breadth of the country. We are dedicated towards providing our customers with customized service offerings, positively influencing their behavior towards our organization. We pride ourselves in the fact that our services don't end at the point of purchase, it continues for years. Our unbeatable after sales service is what makes us different from others and establishes our sense of commitment towards our customers. Ludhiana has proved to be an important photography hub for us in the northern region and we strive to make photography a seamless experience for our customers. Through the launch of our new facility, we are aiming to create a strong after sales network in the region with a convenient touch point for camera collection and repairs." The ASF Level III is equipped with trained engineers and technicians to cater to customer queries. From basic hand tools to high precision robotic tools, the facility boasts of advanced technology to calibrate customer's units with unmatched quality, adhering to Canon service standards. This centre also works on high end camera models of EOS Series including 77D, 80D, 6D, 7D, 5D and M Series.